Huge Value In Used Titleist Golf Balls! Titleist are the number 1 name in golf balls a they stand at the pinnacle of the game. Titleist golf balls are used extensively on all the professional tours and players using Titleist balls routinely win the majors. The research and development that goes into these balls is second to none and it's for that reason that they remain the number 1 ball in golf. These items are a random mix of your favourite Titleist golf balls (the mix does not include Pro V1 and Pro V1X and NXT Tour/NXT Tour S.
All of these balls have been hand graded twice to ensure quality and represent amazing value. Titleist golf balls retail for anywhere from $30 - $45 a dozen in the pro shops. Grab these while you can! Huge Value In Used Titleist Golf Balls! Titleist are the number 1 name in golf balls a they stand at the pinnacle of the game. Titleist golf balls are used extensively on all the professional tours and players using Titleist balls routinely win the majors. The research and development that goes into these balls is second to none and it's for that reason that they remain the number 1 ball in golf. These items are a random mix of your favourite Titleist golf balls (the mix does not include Pro V1 and Pro V1X and NXT Tour/NXT Tour S. All of these balls have been hand graded twice to ensure quality and represent amazing value. 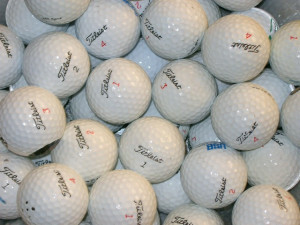 Titleist golf balls retail for anywhere from $30 - $45 a dozen in the pro shops. Grab these while you can!